Convergys ISE electrodes are the measuring components of our Convergys ISE comfort and auto analyzers. After establishing physical contact to the sample specimen via their highly selective membranes, they acquire the resulting potentiometric signals which are then converted into substance concentrations. Our ISE analyzers use individually replaceable electrodes for each parameter. 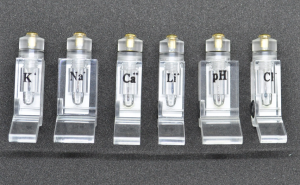 Electrodes are available for the following parameters: K+, Na+, Ca++, Li+, pH, Cl– (and Reference electrode). The electrodes are very easy to maintain. The top lid can be unscrewed for replacing the filling solutions. The electrodes are shipped dry.